Dad's Death and Deciding Not to Run. I signed up, and I planned to go. My FIRST 50 miler !! I know I did the training. Threw in a couple of 3.5-4 hr doubles, and two training 50Kms. Studied the maps, even packed my bag. he was a big volunteer in a small community. Countless years for Jr hockey, and even had a world professional bullriding event (that he organized locally) dedicated to his name! I love him dearly and am still processing what just happened. Needless to say, the last week had too few miles, too many tears, too many buffets, and too many glasses of wine. Nice prep for a 50 miler wouldn't you say? On the positive side, preparing for this run was a nice distraction but I was hoping it would be some kind of healing/ pilgrammage/ or life answer from this event. However , I was lacking my key ingredients for my runs; "Fun" and 'Drive". Yup, no sense of 'ha ha' here, and definately exhausted. Every day is kind of a haze. I am expecting this 'frump' is just a part of my 'stages of loss' and I will deal with it and move on. I hope. Luckily there are a lot of races out there, so I will eventually get back on that horse and charge forward! "SOMEBODY OUGHT TO TELL US , RIGHT AT THE START OF OUR LIVES, THAT WE ARE DYING. THEN WE MIGHT LIVE OUR LIFE TO THE LIMIT EVERY MINUTE OF EVERY DAY. DO IT, I SAY, WHATEVER YOU WANT TO DO, DO IT NOW! " This entry is a bit late... Chuckanut was in March. But then I was busy with 'life events'. Plus, I got a new video camera just before the race and had to figure out the software. Hot tip: Learn how to use your new camera BEFORE using it on a race. It was probably dangerous fiddling with the buttons while running along a ridge and a technical trail. Oh well, I lived. 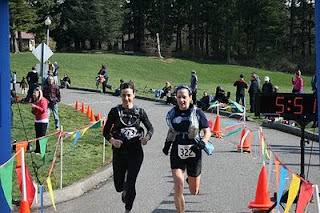 Chuckanut was to be a 'training race' for my running friends in preparation for Capitol Peaks 50 mile. Unfortunately, I had a miserable cold, but I sucked it up and in the end the misery of the cold was offset by such a beautiful day and a wonderful race! Funny, I drank a LOT of water, and it all seemed to fall out of my nose... by the end of the run my sinus's were clear ! !